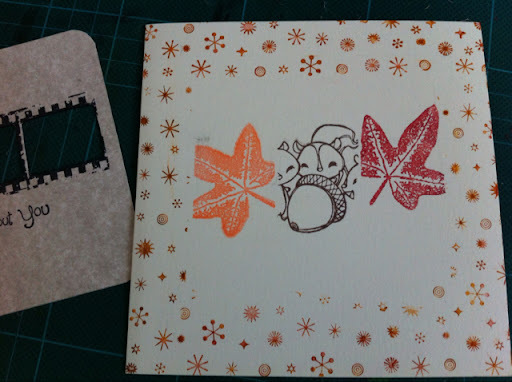 Me and Åsa ordered stamps from Skipping Stones Design a couple of weeks ago, so now that they arrived I wanted to use at least one in their challenge. Since the design had three items in the middle, I choose to use the negative frames from the Grunge 2 set. In the middle frame I wanted to use the cute squirrels from The Greeting Farm's Forrest Friends, and since they're having a challenge with leaves, I used that in the other frames. The sentence is also from that set. 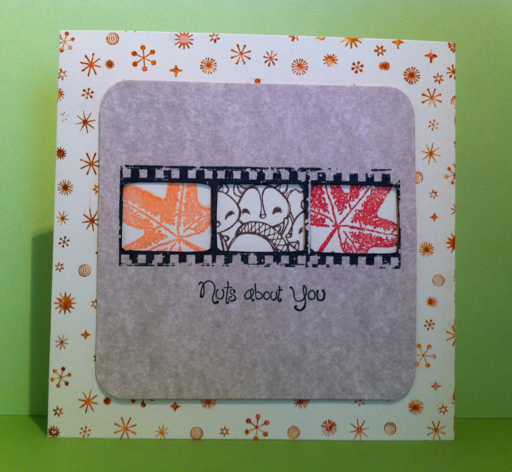 Around the edges of the card I wanted to use one of my new bg-stamps from Hero Arts, Tiny Flakes. Painted it with Distress markers in autumn colors for their contest. 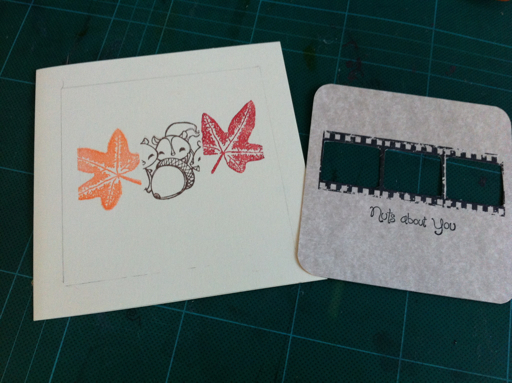 love the way you've cut the centers out of the film stamp to frame your images! Super cute! Thanks for joining us at Skipping Stones Design sketch challenge! Grymt läckert kort!!! Tokgillar hur du använde grunge-settet för att göra ramar till de söta Greeting Farm-stämplarna!!! Jättekul att du ville delta i skissutmaningen hos Skipping Stones Design!